EDITOR'S NOTE: In conjunction with my sister site Gallifrey Exile I've opted to publish The Day of The Doctor review here as well. Let's start right off the bat by saying The Day of the Doctor is a remarkably stupid title for any Doctor Who episode, let alone what has been touted as the 50th Anniversary Special. The title is so damn bloody close to the last Doctor Who story (The Name of the Doctor) that I constantly kept calling The Day of the Doctor The Name of the Doctor. Someone MUST have thought that the titles were simply too similar to not make people wonder, right? Of course, this was before I learned that the Christmas Special is to be called...The TIME of The Doctor. Name, Day, and Time. All that's missing is Rank. In any case, The Day of The Doctor purports to be the 50th Anniversary Special to one of the most wildly-successful science-fiction shows on today, which has gone from cult to mainstream to almost mania. I have wondered whether Doctor Who's massive popularity has damned the show to being mere spectacle, all bright lights and rapid pacing to cover plot holes and continuity errors to please a group of rabid fans who know little to nothing about what came before the show's revival in 2005. I'd argue that most fans celebrating The Day of The Doctor know only or almost exclusively nothing but Doctor Who episodes from Rose onwards, the Ninth through Eleventh Doctors being their primary points of reference. I've already talked about that, but now in the second part of our trilogy, let us go over the actual episode itself. 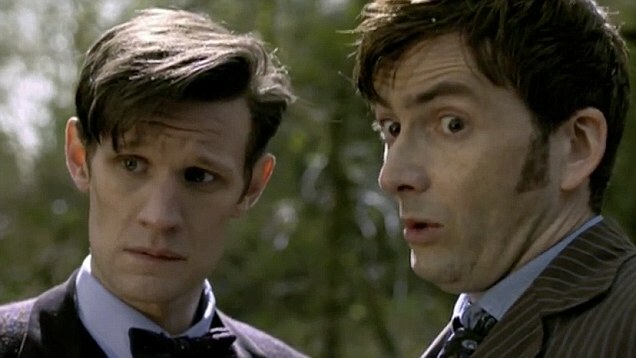 The Day of The Doctor cannot be called a 50th Anniversary Special because there is so little within it to actually suggest that much came before it. There are nods to the Original Series (starting from the opening credits, which are the original opening credits seen in 1963 sans the 3-D effects), but apart from a few (which I'll mention here and in the future) so much of The Day of The Doctor revolves around 2005 onwards: the Doctors in the special, the Time War that has been dominant in NuWho, Companions and characters that came after Rose. Leaving aside the dearth of acknowledgements of anything Who-related pre-2005 The Day of The Doctor is a big, lavish, loud spectacle that does the unthinkable: celebrate not the show itself but the revived series' ability to basically 'hit the reset' and erase so much that came before that it would be more intellectually honest to have Tom Baker onwards just open his eyes and say, "It was all a dream..."
Clara (Jenna Coleman), now a teacher at Coal Hill School, receives a message that 'her doctor' has called. She jumps on her motorbike and speeds towards a desolate place, where the TARDIS and The Doctor (Matt Smith) await. No time to go gallivanting as the TARDIS is picked up by helicopter and transported to The National Gallery in London, where Kate Stewart (Jemma Redgrave), UNIT's Head of Scientific Research (perhaps the 'scientific advisor'?) and her aide Osgood (Ingrid Oliver) inform the Doctor that he was appointed the Curator of the Undergallery by Queen Elizabeth...the First. In the Undergallery the Doctor is presented a Gallifreyan painting (bigger on the inside than the outside), with two titles: Gallifrey Falls or No More. This painting is of the fall of Arcadia, Gallifrey's second city during the Last Day of the Time War. We now inside the painting to The Last Day of The Time War. The War Council knows things are going badly, and a strange figure identified by the Daleks as The Doctor (John Hurt) blasts into the walls "No More". The War Council discovers that there is one weapon of last resort missing: The Moment, a weapon so powerful that not only can swallow galaxies but has grown a conscience. The Doctor (or War Doctor if you like) goes into the desert to set the Moment, but he not only cannot open it (bemoaning the lack of a big red button) but the conscience of The Moment takes shape in the form of Rose (Billie Piper), or more specifically Bad Wolf Rose. She urges him to think of The Children before using The Moment, and she opens a time fissure to show him his future. Through this fissure drops in...a fez. After examining more of the Undergallery (including picking up a fez), the mystery of the paintings grow. The glass has been broken from the inside of the paintings. As part of the examination of the Undergallery, we see a portrait of Good Queen Bess with her husband, The Tenth Doctor. Now it's off to Merry Olde England 1562, where The Doctor (David Tennant) is courting Her Majesty Queen Elizabeth I (Joanne Page) in a lovely picnic. Things are going well, even to Her Majesty accepting the Doctor's marriage proposal. The Doctor, however, knows that The Queen is NOT The Queen, but a Zygon. Only, one small error...the Zygon is NOT the Monarch, but instead the horse he rode in on. In the chaos and confusion of having Queen Elizabeth I and her Zygon double with him unable to fully find the fake from the real, a time fissure appears and in drops...a fez. Now from the portal the Eleventh Doctor drops in the Tenth. There's some banter, when from this comes The War Doctor, seeking the Doctor. Now the three are arrested by Queen Elizabeth I and thrown into the Tower of London, thrilling Eleven but not pleasing either Ten or War. Meanwhile, Clara is taken by Kate to the Black Archive, where the memory of every worker is wiped out at the end of their shift. This explains why the TARDIS-proof Archive has photographs of all the Doctor's past Companions, including Clara. Within the Archive is the Time Vortex Manipulator bequeathed to them by Captain Jack Harkness on his death (or at least one of them). There's a dark twist for Clara, however, as Kate and Osgood are really Zygons about to take over the Earth. Clara, however, gets the access code to the Manipulator (cleverly scratched on the walls of the Tower by the Eleventh Doctor all those centuries ago) and speeds to Elizabethan England. The Doctors all attempt to a.) escape the Tower and b.) think of how the actions of the unacknowledged Doctor affects them. In order for them to find a way out the War Doctor starts calculations on his sonic screwdriver, and the three discover that these calculations, which would take hundreds of years to complete, have been going on through all the other Doctor's sonics, completing at the time of the Eleventh. However, all that for naught, as Clara comes in and informs them that the door had been open all that time. Elizabeth, who we eventually discover is pretending to be a Zygon, tells them of the paintings, which is how the Zygons are freezing themselves until the appropriate time...2013 London. Of course, we have to pause for Ten to marry Her Majesty, then off in the TARDIS to save the world. In the Archive, the Zygons and the Humans are about to play chicken, Kate determined to blow up the city to save the world. Fortunately, Eleven had called from the future to the present to get the Gallifrey Falls/No More painting into the Black Archive, and then the Doctors all burst through it and force the warring sides to peace. The War Doctor, however, knows he must use The Moment. He is joined, however, by Ten and Eleven, who decide they will share the burden of using The Moment to destroy the Daleks AND the Time Lords. Clara is heartbroken that it's HER Doctor who kills The Children, but now he and the other two have decided to do the unthinkable: they will rewrite history and SAVE Gallifrey. They race their TARDISes (TARDI?) to the besieged Gallifrey and when the War Council is told of their plans (to freeze Gallifrey and lock it in a statis cube to make it appear that the Daleks, who would be destroying themselves in the confusion and make the universe think Gallifrey was destroyed too), they tell the Doctors the calculations would take centuries. However, not to fear, as all the incarnations of the Doctor appear to the Council to space their own TARDI and join forces. All twelve, the Council thinks, until one of the Council says, "No. 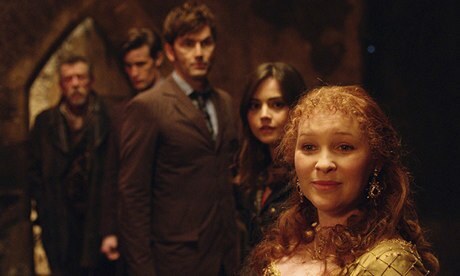 All THIRTEEN" (and we get a quick glimpse of the upcoming Doctor). Plan successful the War/Tenth/Eleventh Doctors make their farewells. The time streams are too confused to allow them to remember all of this, so the Ninth and Tenth Doctors won't remember saving Gallifrey and think instead they destroyed it. (I digress to say that when the War Doctor says, "but at worse, we failed doing the right thing as opposed to succeeding in doing the wrong", the only thing that came to mind was OneRepublic's Counting Stars: "I feel something so right doing the wrong thing/I feel something so wrong doing the right thing".) Tenth also will not know his future death on Trenzalore, but for now things are good. However, the Curator (Tom Baker) tells Eleven that people always get the title of the painting wrong. The painting has two titles: No More or Gallifrey Falls, but he tells the Doctor that it's not two titles but one: Gallifrey Falls No More. Gallifrey survives, and now the Doctor can search for it. I know that the NuWho fans who were watching The Day of The Doctor in the theater were thrilled with everything about the episode (one of Bryan Majewski's friends who sat next to me used the word, 'brilliant' to describe how Gallifrey survived), but that was just something that felt wrong to me. I was never a fan of The Time War and thought from the get-go that it was a mistake to erase Gallifrey when Doctor Who was rebooted. Despite that, what motivated The Doctor was survivor's guilt, the hurt and rage within him to have to exterminate his own people to save the universes. With this timey-wimey reboot (something writer Steven Moffat is simply too fond of) that is all erased, rendering a lot of post-Rose Doctor Who either nonsense or just a waste of time. When those episodes are watched, we know that he is going through all this for nothing. Again, he might just as well wake up and say, "it was all a dream". However, let's move on from that (more on that another time) and move on to whether The Day of The Doctor worked. It didn't, again because the stakes are now never going to matter. If we are always going to resolve things by basically going back and altering history (even if it means contradicting or erasing what came before) what tension exists in any story, let alone this story? I note that at least twice times things were basically reset to get the Doctor out of his predicament (when the Doctor makes the call to send Gallifrey Falls/No More to the Black Archive and when The Doctors all jump in to save Gallifrey). This is an easy way to get out of the difficulties Moffat gets into but it diminishes the Doctor's greatest virtue: his ability to think his way out of situations. However, there are other things that fell flat. A big problem is in the performances. Page was simply unbearable as Elizabeth I, turning the Warrior Queen as nothing more than a breast-heaving fangirl, permanently infatuated with the Tenth Doctor (perhaps she was suppose to represent all those little girls who fantasize about Tennant, Smith, and to a lesser degree Christopher Eccleston sexually? However, I would have thought the Osgood character, down to wearing a Fourth Doctor-type scarf, was parody enough). I was also surprised to see Tennant give a bad performance. There were times when he seemed not so much bored but frustrated, as if he couldn't make himself believe what he was saying. Take when he tells Liz that he knows she's a Zygon via a machine. He presents it to her and says, "Ding." "What's that? ", she screeches (I'm serious, Page was embarrassing throughout The Day of The Doctor). "A machine that goes 'ding'", he replies. This is something that I imagine the Eleventh Doctor would say, not the more serious Tenth. Yes, Tenth could be goofy, but not this goofy. Similarly, when Tenth revisits his Big Speech about who he is from Voyage of The Damned, he stops his tense tone when he realizes he's talking to a real rabbit and not a Zygon. It's thrown in there to please the fans, but it takes it all out of context: what was once a statement of courage and defiance now is a chance to either wink to the hard-core NuWho fanbase or just mock the Tenth Doctor. I actually felt a touch sorry for Tennant, one of the better Doctors, who was veering close to parodying his Doctor to please those passionate for the dim-witted Eleventh. While watching him, the phrase "Don't you think he looks tired?" popped into my head. Not as bad as I felt for Billie Piper, whose Bad Wolf Rose is there just to basically be there. For being a sentient doomsday machine she isn't taking much of this seriously. Perhaps it is too tempting to ask at this juncture why a figure from his future would appear as opposed to someone from his past (say, Lalla Ward's Romana II or Carol Anne Ford's Susan Forman, the Doctor's granddaughter, both who are very much alive, but since that might confuse NuWho fans...). Serving as the Clarence to the War Doctor's George Bailey, Piper has not much to do. Frankly, any old Companion would have done. Here perhaps is why I find it so hard to call The Day of The Doctor an actual 50th Anniversary Special. 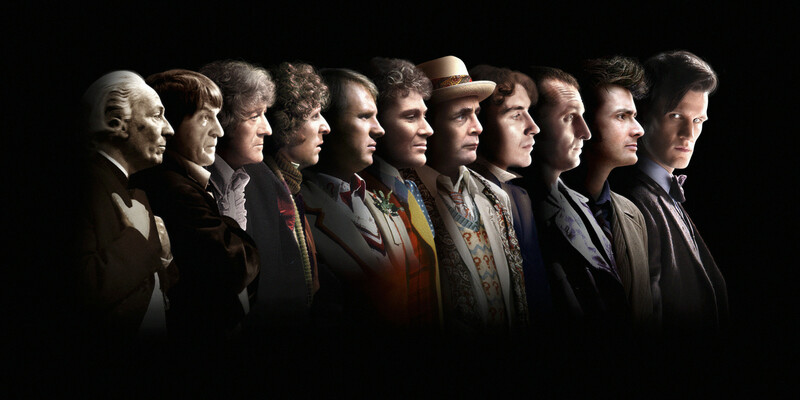 All the Doctors and Companions: NuWho. All the characters save the monsters: NuWho. The guest character of Queen Elizabeth I: NuWho. As I said, there are nods to the Original Series (certain lines and little hints), but on the whole nothing really connected The Day of The Doctor to anything from An Unearthly Child to Survival/Doctor Who: The Movie. More things that I found generally displeasing were Murray Gold's score (I hated the cutesy and/or serious music blaring at us to virtually no end) and the visual effects. Yes they were big and bold, but they were too reminiscent of Star Wars, almost as if they were showing off in the Last Day of The Time War just how much money they spent on it. However, I'm not in the habit of thoroughly damning something if I find something good. 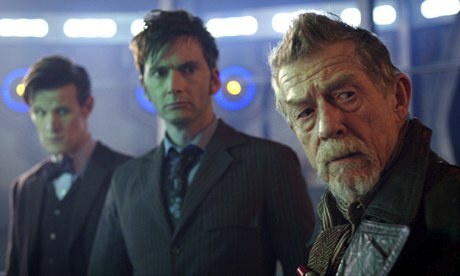 John Hurt was brilliant as The War Doctor, bringing a sense of pain and emotional weight to the role. He also showed Tennant and Smith that sometimes taking and behaving seriously makes one a more authoritative figure. Whenever he mocked his successors tendency to whip out their sonic screwdrivers or their silly catchphrases (Timey-Wimey?) Hurt showed not only the presence of intelligence (and how in the past, the Senior Doctor always knew better than those that followed...like a Dandy and a Clown), but in his regret and fear of the course he had to take made the Doctor a deeply wounded and conflicted character. As much as I detest Smith I found that his scenes on Gallifrey with Coleman, when he isn't flipping his hands, when there is no music, when he is allowed to take things seriously, you actually get a good performance out of him. When he discusses the pain of his past act with a distressed Clara, it was deeply moving and touching. In fact, when things get past the whiz-bang of the lights and the loud music, when things are allowed to be taken seriously and settled down, we find that not only are the actors good but the scenario can be emotionally rewarding. Seeing Tennant, Smith, and Hurt about to blow up Gallifrey, no sounds apart from their voices, makes things feel tense. For me, as someone who is more geared towards Classic Who than NuWho, who has become disillusioned with Doctor Who (in particular with the Smith/Moffat Era), The Day of The Doctor didn't celebrate 50 years of a television series. It didn't even really celebrate the eight years its current regeneration has been on. The Zygon subplot wasn't all that necessary to the overall story of rebooting the Time War (and I wondered why Elizabeth I didn't just wipe out the Zygons rather than allow them to keep going into the paintings). I think that if I were fair The Day of The Doctor would really rank at 4/10 because in many ways it's better than some of the awful Classic Who stories (The Ark, The Gunfighters, Timelash). However, I knock one point down for it failing to be an actual anniversary special. 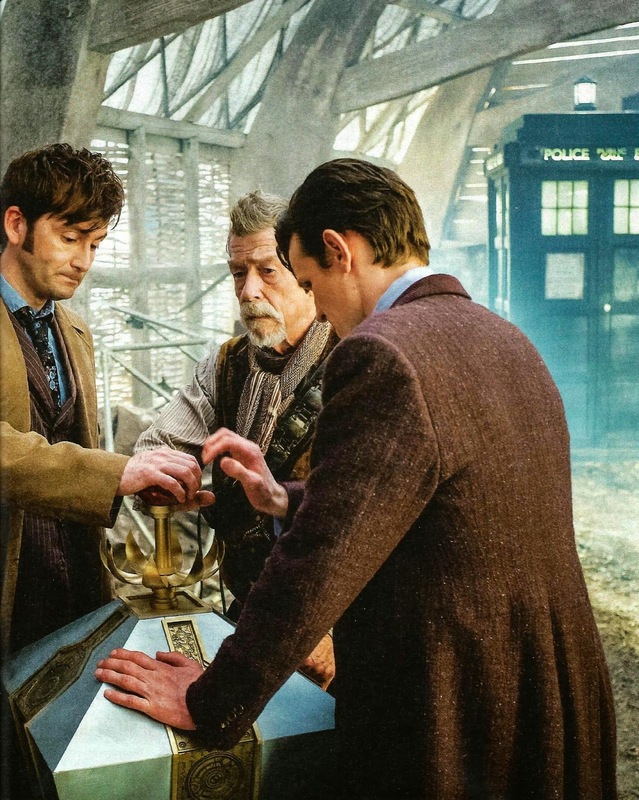 What The Day of The Doctor was the 'handy-dandy big shiny reset button' writ large.